Stop All Human Activity Now! What are, nettlesome wannabe do-gooders, if not the sort of people willing to be generous with other people’s resources? I ask myself that daily, quite frankly, knowing full well that it isn’t going to make EUvian do the only thing they know how: leveraging others’ ability to do what they’re incapable of. While it is likely at this stage, that the word “summit” has been banalized from overuse. The lack of a specific roadmap means that the June talks in Bonn will have to continue to debate operational issues rather than moving on to debating the substance of any future treaty. Yvo de Boer, the UNFCCC executive secretary, told BBC News that the chances of seeing a new treaty this year are "very slim". "I think that developing countries will want to see what the nature of an agreement is going to be before they will be willing to turn it into a legally-binding treaty, so that basically means a two-step process," he said. As opposed to the preferred “one step” process, whereby the nations of the world agree to a legally binding mechanism concocted by a small committee (considering the global terms on which they would like to operate,) without knowing what the consequences are. Euranet, the sneery, EU funded radio operation, had heading their page a spelling error worthy of an unpaid blogger or University intern working for peanuts. 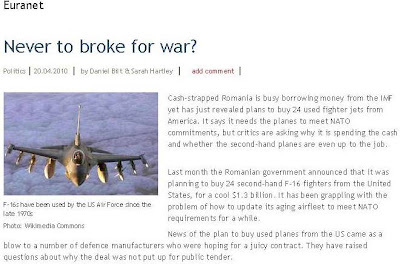 With a sharp, critical eye on Romanian relationship with the United States, formed out of a complete absence of European support for Romanian security concerns, they are being critical of the Romanian military’s purchase of 24 refurbished F-16s. It could only “come as a surprise” to them if the EU-3 operate on the assumption that all other members of the union were “junior members” in nature, and can’t act without their approval on national matters. Never mind the fact that German and French tried to condition financial aid to Greece on the sale of ships and fighters, or what that does to the Union for all’s relationship with Turkey. They European governments ARE the embodiment of that secretive and weird mystery-illuminati that so many of their citizens seem to think are lurking under every Menorah and behind every American flag. As to the rest of the story, the likes of Euranet seem unwilling to touch the inconvenient background to the story from late March. Swedish defense manufacturer Saab on March 26 asked the Romanian government to explain why it has decided to purchase second-hand U.S. F-16 fighter planes to the detriment of the Saab-manufactured Gripen fighter. The issue was also brought up in a meeting between Romanian Senate Chairman Mircea Geoana — the leading opposition figure in Romania — and EU member state ambassadors in Bucharest on March 25, with Geoana stating that he will bring the issue up for vote in the legislature if the government does not respond to the criticism. With the announced purchase of second-hand U.S. F-16s Romania is essentially signaling that its commitment to the U.S. security alliance takes precedent over its economic alliance with Europe. Along with Swedish Saab, Romania also spurned the French-made Rafale and the British-Italian-French-Spanish Eurofighter. Bucharest’s decision also means that Saab will have to depend on the upcoming Brazilian decision on whether to purchase Gripen NG’s, F/A-18E/F Super Hornets or Rafales. Indications at the moment are that Brazil will choose Rafales in what is considered a “political” decision by the Brazilian government to increase its military cooperation with France. Ergo: “cooperation” = sales from governments that wouldn't lift their finger if the Russians, always searching for Ivan Ivanovich's imaginary collective manhood, start to meddle in the Black Sea. Bien compris? Nevertheless, says Brannigan, "Germans can be proud of this law." Without the help of lawmakers, he says, Germany would hardly have seen such dynamic development of renewable energy sources. What was once a niche industry has turned into a sector with global importance. The solar industry is responsible for almost 80,000 jobs in Germany alone. But lawmakers have overshot the mark by far, at least when it comes to subsidies for solar energy. Anyone who installs solar panels benefits from guaranteed feed-in tariffs for the next 20 years. That means that, over a 20-year period, Germany's electricity customers will pay a total of around €14 billion in subsidies -- just for the solar panels that were installed in 2009. And that cost is likely to rise in the future, because Germans are mounting more and more solar collectors on their roofs. Economists estimate that all the solar panels installed by 2013 will cost German consumers more than €70 billion. Thanks to the generous subsidy program, crops on some fields have been replaced with arrays of shimmering, bluish modules mounted on automated stands and tilted toward the sun. And all of this is being done for an amount of electricity that meets only 1.1 percent of German demand. The polls are awful these days, while commentaries range largely from the impatient and disappointed to the cruel and vicious. Mr. Sarkozy’s seemingly raucous, self-absorbed personal style is a constant target, while his campaign promises to vitalize and reform French politics and economic performance are increasingly mocked as substanceless. [Both Jacques Chirac and] his predecessor, François Mitterrand, had worse poll results than Mr. Sarkozy, and even more obvious political setbacks, each losing his parliamentary majority in mid-mandate elections. …But both men, who ruled into their 70s, projected a kind of presidential serenity that Mr. Sarkozy, 20 years younger, has not. They kept a fairly regal distance from daily domestic policy making and politics — in contrast to their successor’s hands-on-everything approach. And Iran. Ooh la la! All these advisers telling me Khamenei is not Ahmadinejad and Ahmadinejad is not Larijani. C’est du baloney! Du pur baloney! They’re all the same band of liars playing with us like a cat with a ball of wool. I have yet to see any mention in the US general interest press, or even the financial press of the nationality of the Goldman Sachs VP who played a supporting role to John Paulson, the man behind the failed financial product that the SEC’s nicely timed investigation is all about. Je suis très étonnée qu'il n'y ai que des français qui aient très mauvaise réputation. Tous les traders sont à mettre dans le même panier. on devrait supprimer la BOURSE on serait tranquille. As usual, there are no other people out there in the world, and that fact that people are more relevant for who they are instead of what they do figures into a good reason to bloviate stupidly about market economics that the commenter doesn’t understand anyway. It’s like the old off-hand statement one used to hear “those smart, humane people” say about how there shouldn’t be any money, and then everyone will be free of worry and prosperous. In either case, I’m always trying to figure out who’s taking the other side of that trade. There’s no social prohibition on calling THIS ‘climate model’ flawed. No-one will berate you for hours on end. Then again, unlike the earthquake in Haiti, no-one is leaping to blame the Eyjafjallajökull volcano on manmade global warming. Nature’s power, yadda-yadda, indeed, not to mention the fine example it makes of man’s powerlessness to effect it. Just don’t say anything about man not being responsible for the entire earth’s weather. “It is a black box in certain areas,” Matthias Ruete, the EU’s director-general for mobility and transport, said on Monday, noting that many of the assumptions in the computer models were not backed by scientific evidence. Berlin has been hesitant on the issue of a financial package for Greece and Chancellor Angela Merkel has suggested it should be possible to exclude offending countries from the Eurozone. The Greeks should not take such a show of contempt sitting down, writes the left-liberal daily Ta Nea: "The German attitude has nothing in common with how Kohl, Mitterrand and Delors saw the EU, namely as a melting pot that would bring about European unity. The time has come for us to react. Berlin has reaped much advantage from the EU, and now it is refusing to provide resources to help it out in a time of need. Like all good little retrograde leftists, the class warfare card gets pulled out, even if does operate on the assumption that Germans are rich because they’re German, not because of what they do. It’s the SOS of European history. They should import fewer German products and buy more Italian, French, Spanish and Greek goods. Only in this way will Merkel grasp that a racist attitude to other countries can be economically detrimental, particularly to Germany." I guess that makes them “Anglo Saxon” straw-men after the fashion of the French nationalists looking at any population that goes its’ own way without taking the vague desires of their population as a guide to how they should conduct their lives. My approach to that issue is to immediately make the point that if the rest of us are Anglo-Saxons, something that the Francophilic users of the term mysteriously avoid applying to Germans, is to say that it would otherwise be just to call the users of the term Visigoths, fans of brutal, central authority, and tribal goading and mayhem, which is actually more applicable to the melting-pot societies they try to apply the disparagement to. The array of one caste against another, a practice which has never failed to destroy a government and degrade a people, is conspicuous everywhere. The court was regarded rather as a place of execution than the seat of the rendition of justice; the judge rather an avenger of injury, than the representative of the law and the guardian of social order. The execrable errors of heretics in general, having been already prohibited and disposed of, it now becomes our duty to make special provision for some that exist in our days, and of which we are, at present, well aware. For while the virtue of God, by the sword of his Word, extirpated all other heresies, root and branch, we have to lament that the soil of our kingdom is still only defiled by the infamy of the Jews. If that isn’t an accurate reflection of present day populism, I don’t know what is, and to think that it came after 1360 years of self-administered diversity training. This will give you an idea of some of the outrage that’s fueling the tea party movement. When I asked a local tea party organizer what got her started, one of the first things she mentioned was the contrast between what ordinary people were doing with their own budgets—cutting back, giving up on luxuries, trying to dig themselves out of debt—and what the federal government was doing: a spending binge financed by vast new quantities of debt that we will have to pay. People are outraged, and they are terrified of a future in which America’s only growth industry is government. The New York Times just put out an analysis of a survey on the tea party movement. I love it when the mainstream media does surveys like this, because the results are usually a mix of the totally obvious and the totally wrong. For example, they found out that "while most Republicans say they are 'dissatisfied' with Washington, Tea Party supporters are more likely to classify themselves as 'angry.'" I hope they didn't pay too much money to find that out. Now for the totally wrong part. When I got an e-mail alert about this article, the headline read, "Poll Finds Tea Party Anger Rooted in Issues of Class." Issues of class? What does that mean? The article says that we're motivated by "the conviction that the policies of the Obama administration are disproportionately directed at helping the poor rather than the middle class or the rich." Yeah, we're concerned that the government hasn't done enough to help out the rich, that's why we're marching. Not enough bailouts for Goldman Sachs. These guys are incorrigible old Marxists, so they want to see everything as class warfare between the workers and the capitalists. So they miss the real class division that is driving the tea party movement: a division between the producer class versus the parasite class. It's a division between people who take on the responsibility of supporting themselves and who end up having to pay all of the bills for runaway government, too, versus the people who want to live off of our work. That includes the poor people who are, for example, getting checks from the government for "tax credits" on income taxes that they never paid. This is the new form of welfare, by the way, because it's a way that politicians can give handouts while calling it a "tax cut." So you give people a tax credit that they can claim as going toward an income tax "refund," even though they don't make enough money to pay income taxes in the first place. It's a handout disguised as a tax refund. But we're also angry about the guys making $150,000 a year as bureaucratic paper-shufflers in Washington, and the guys with politically connected businesses who are getting money from bailouts and the stimulus and the "green jobs" racket. It's not about rich versus poor. It's about parasites versus producers. It's about takers versus makers. Assemble all these pieces and an Obama Doctrine begins to take shape. It might be summed up this way: Ignore the great threats and cloak the lesser threats in faux unity, pomp and circumstance; talk incessantly and carry a shrinking stick. Somehow, I doubt that's the change most Americans have been hoping for. I've been called an oreo; I've been called a token; I've been called a sell-out; I've been called an Uncle Tom; and to all of those people that call me names, I want to tell you them something: all that does for an old paratrooper, just makes him dig in his heels even more! I am standing here with my American brothers and sisters! And it has nothing to do with race! It has nothing to do with color! It's all about your character! And we don't have character in Washington, D.C.! …I am the liberals’ worst nightmare! They cannot afford to have a young man from the inner city of Atlanta, Georgia, to rise up in this country, because I completely invalidate all of their social welfare policies that have been tearing up our country. Good, because I don’t think the poor are hiring anyone. This repeating of this pedantic argument was overdue, anyway. It involved the RELATIVE differences in earnings. In other words, if you eliminate wealth in this statistical model, the rate of poverty falls. Not REAL poverty, just the poverty identified as that called out RELATIVE to the richest earner. In fact, the fascinating thing about this notion is that if the rich REALLY DO get richer, and the middle income earners are impoverished, it still shows a drop in RELATIVE poverty – which they are using to calculate the rate of poverty. That’s to be made distinct from ACTUAL poverty. Absolute social success in the “income gap” model means that everyone is poor, especially since they no longer have anyone to work for, short of a central government who will have to RAISE THE TAXES ON THE POOR to fund the milk of human kindness, which, at that point, usually requires that you know someone to have access to. What does growing income inequality mean for society? Koedijk said he feared it could undermine social cohesion. Those on top, particularly in finance, can do as they please for the rest of their life after landing a top position. This leaves them free from entering into any long-term commitments. Which is known to Americans as “owning your fate” and freedom from government dependency. It doesn’t require a great deal of wealth to achieve, just common sense, a ken for saving and investing, and a liberated mind. In fact it’s very “middle class” once you walk off of the plantation of the left. On a cool but sun-drenched Sunday, the president and three golfing companions went to Andrews Air Force Base to play 18 holes. It is the 32nd time Mr. Obama has played golf since taking office Jan. 20, 2009, according to CBS Radio's Mark Knoller. He said in 2008 that he gave up golf "in solidarity" with the families of soldiers who were dying in Iraq. "I don't want some mom whose son may have recently died to see the commander in chief playing golf," Mr. Bush said in a White House interview Saturday with the Politico. "I feel I owe it to the families to be as — to be in solidarity as best as I can with them. And I think playing golf during a war just sends the wrong signal." He stopped playing after he received word of a deadly attack in Iraq while playing golf during a stay at the family ranch near Crawford, Texas. "They pulled me off the golf course, and I said it's just not worth it anymore to do," Mr. Bush said in the interview. Since Mr. Obama took office, 397 soldiers have died in Operation Enduring Freedom in Afghanistan. Another 151 have died in Operation Iraqi Freedom. The idea for the subsidised tours is the brainchild of Antonio Tajani, the European Union commissioner for enterprise and industry, who was appointed by Silvio Berlusconi, the Italian prime minister. The scheme, which could cost hundreds of millions of pounds a year, is intended to promote a sense of pride in European culture, bridge the north-south divide in the continent and prop up resorts in their off-season. Do note, that would cost hundreds of millions of tax-payer funded pounds a year. "Vigilance" Now Has a Place in the Major League of Fuzziness Alongside "Inacceptable"
Is this a descending spiral of resolve fated to result in sanctions that pinch, nip or tweak? …the United States could seem to some of its allies to be shying away from pressing the United Nations to adopt extensive sanctions on the export of refined petroleum products to Iran. …Besides, if we’re dealing in morality on serious methods for depriving Iran of nuclear weapons capability or a bomb, lowering the level of gasoline exports to Iran instead of carrying out airstrikes on presumed nuclear installations would seem to be a far preferable “humanitarian” approach (Mr. Rhodes’ word) for both Iranians and the U.S. military. …Ah, vigilance. It’s also the word, open to a hundred interpretations, that has come under discussion as a substitute for U.N. sanctions banning transactions involving Iran’s central bank. You’ll Eat it and You’ll Like it! The EU’s Lisbon Treaty (Not to be confused with the Lisbon Strategy), it seems, has a Trojan Horse inside it. Laws, if passed by elected MEPs, can be simply re-written in closed committee as a part of the process of outlining the means of exercising those laws. Called “comitology,” it sounds very much like a term imported from France, one bound up with the far-left fantasies of a social state of lockstep action by the population. The word comitology is going to disappear! The only common element of understanding about it is going to be removed from the dictionary. From now on, people will talk of delegated acts (which replace quasi-legislative acts) and implementing acts (which replace comitology strictu sensu). And it will simply be “assumed” to be part of the process that doesn’t need to be identified or mentioned. 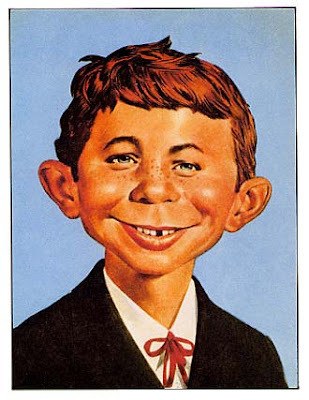 “Thank goodness!” Insiders must be thinking... “Democracy averted!” As for magnitude? He concludes, "comitology represents about 98 percent of the regulatory activity of the Union in a year. And this 98 percent is the Commission's competence". The author further notes that otherwise, the implementation of European construction would come to a standstill. Not quite. It’s those measures pushed through the Comity process that would come to a standstill, as only 2% of them seem to have the simplicity to become law on their own, or enough public support to not need revision. What’s worse, is that the act of arguing and proposing those laws, absent the language of executable law, details, and enough information to determine the consequences from jump street, simply encourages irresponsibility and the unmooring of the caring sounding declarations from reality, as though it would be nice if every subject and serf should have their own unicorn ranch, and that it’s a human right, knowing that a committee is there it work out how to redefine a Unicorn and a Farm to be, say, a envelope with a stamp affixed to it. It’s a moral hazard like no other.